Now this may not be the prettiest photograph I've ever taken, but it is one of the best Chinese dishes I've ever cooked. I made this while I was having my kitchen floor replaced, the final part of the work we have had to do as a result of dry rot at the front of our home. So there I was cooking on a single electric ring in my back kitchen (utility room), with the joiner working away in the kitchen sawing and hammering. It's perfectly possible to cook good food in this limited space but not all that great for food styling and photography! In Western countries, the Chinese food eaten in restaurants is often a far cry from the dishes prepared and served by the Chinese themselves. This is because the Asian communities that have settled in so-called ‘China Towns’ around the world, in cities such as New York, San Francisco, London and Paris, have mastered the art of adapting their cuisine to suit local tastes. Added to which, this cuisine is often influenced by other Asian dishes, so much so that food served in one city’s China Town may be heavily influenced by other Asian dishes, so much so that food served in one city's China Town may be heavily influenced by Vietnamese dishes whereas in another it may resemble closely Thai cuisine. 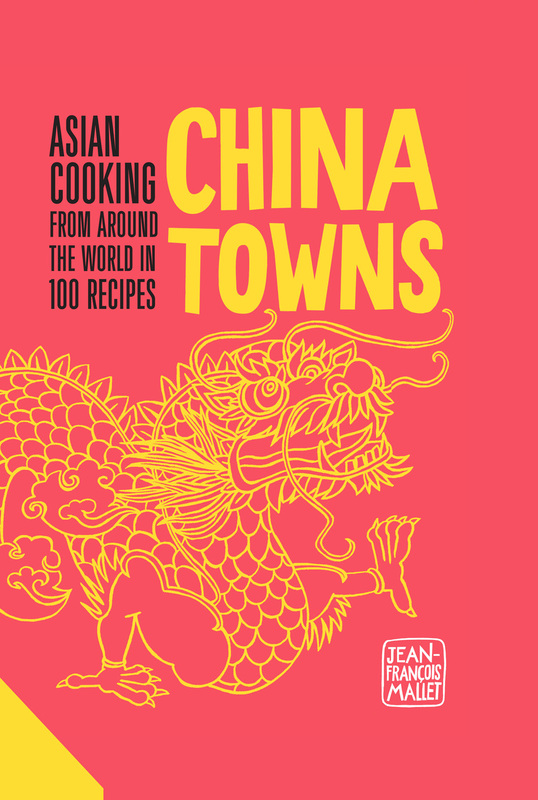 In this visually stunning cookbook, author Jean-François Mallet goes behind the scenes in Chinese communities around the world in order to understand how and why the food changes so much depending on location. 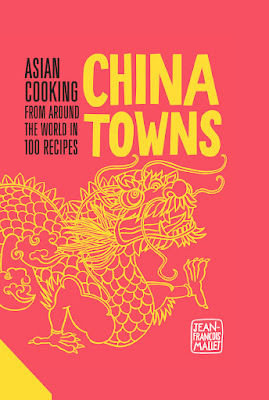 As well as intimate portraits of these fascinating communities, this stunning book contains, 100 delicious recipes capturing the essence of China Towns from across the world and their various geographical influences. This is a fascinating read, where you learn about the different culinary families of China and the influence of Asian immigration on what we know as 'chinese' cuisine. This is a very large book containing information, photographs and recipes for Starters; Chinese Dumplings; Soups and Broths; Chicken and Quail; Beef; Pork; Duck; Fish and Seafood; Weird and Wonderful; Vegetable, Rice and Side Dishes; Noodles; Tea, Drinks and Desserts. The recipes reads like the menu of a very eclectic Chinese restaurant, here is what I would choose... well I might not manage all of these dishes, but they were too good to leave off the menu! It is certainly not for the faint hearted as it contains recipes for chicken feet and there are not very many vegetarian recipes. 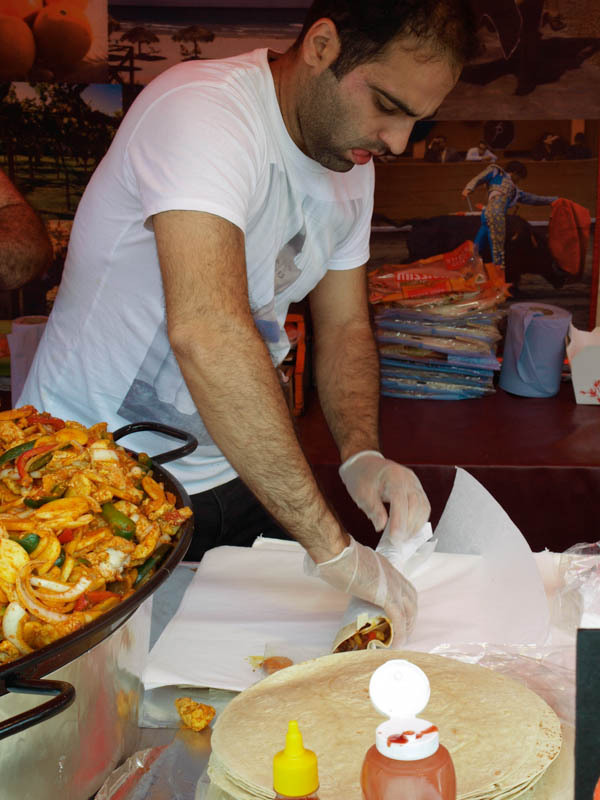 It's also not for purists who are looking for original recipes from the country, these are unashamedly adaptations of the originals to suit the ingredients and tastes of the people around the world. So if you would like to cook a dish that would be served in China Towns across the world, then it's for you. The stories and information preceding the recipes are as interesting as the recipes themselves. There are lots of interesting photographs of the China Towns as well as of the recipes. I found the recipes well written, many are quite short and don't require unusual ingredients. I loved 'How to eat with chopsticks and what you should never do with chopsticks'. This is one big book, it doesn't sit open very well for cooking, I had to weigh it down to keep it open. Although there are lots of photographs, the photos for the finished dish are not always beside the recipe, which I prefer. 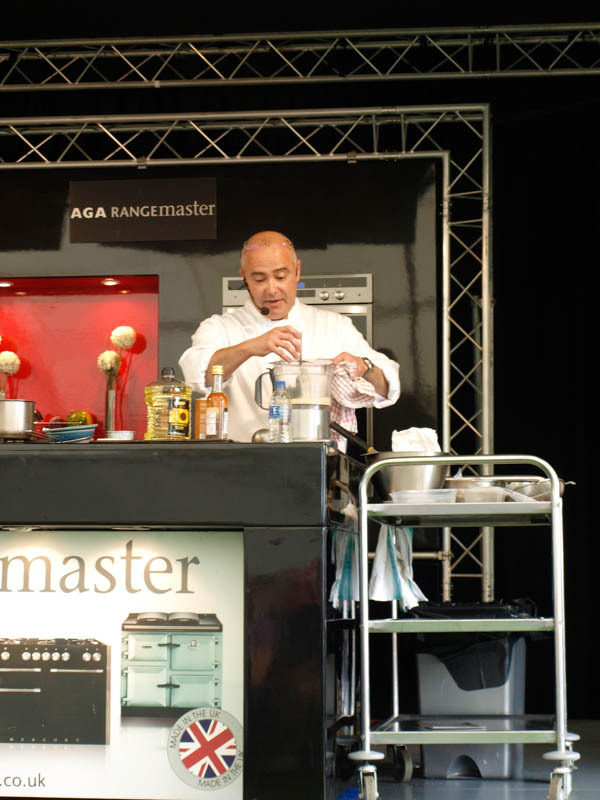 I was certainly impressed with the recipe I cooked, but I felt you could have condensed the content into a slimmer volume which was less expensive and easier to use in the kitchen. 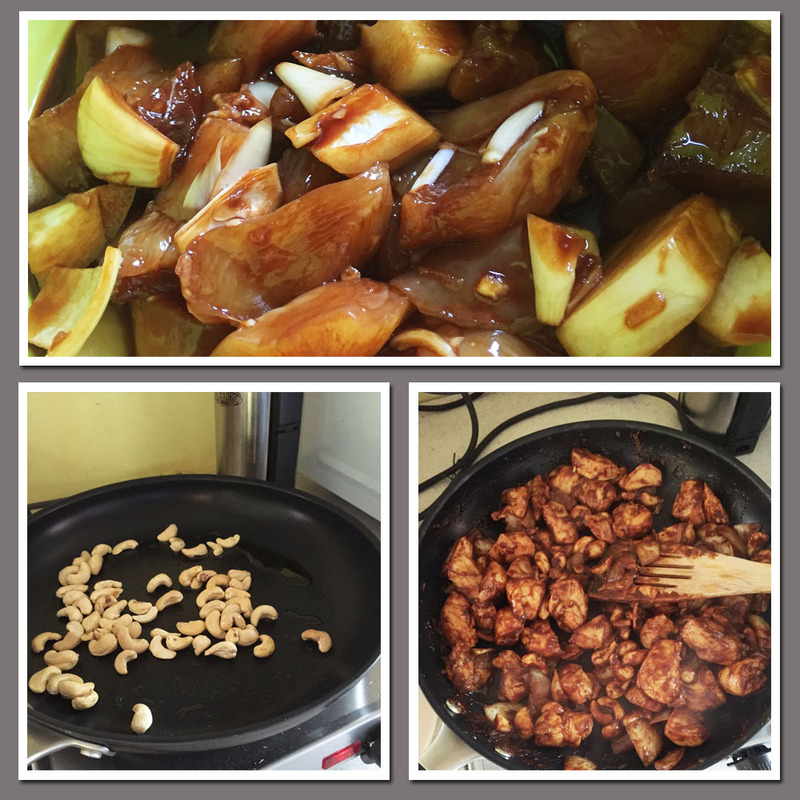 I am quite keen to try some of the other recipes after the success of the Fried Chicken with Cashew Nuts, so overall a bit of a mixed verdict. Peel and chop the garlic and onion, then cut the chicken into small pieces. In a bowl, mix the chicken, garlic, onion, cornflour (cornstarch) and soy sauce together, then leave to marinate at room temperature for 2 hours. Strip, rinse and dry the basil. About 20 minutes before serving, heat the oil in a large wok over a high heat. Add the cashews and stir-fry for a few minutes then add the chicken and marinade and cook for 10 minutes. Once the chicken is cooked, add the basil leaves, stir and turn off the heat. Serve immediately with fragrant rice. 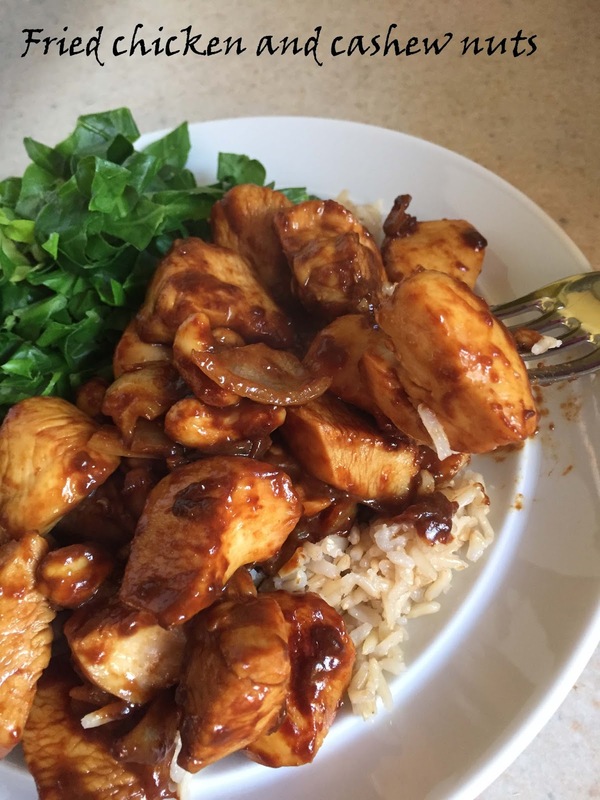 Such a simple recipe, but the flavour was really close to what you would eat at in a Chinese restaurant and the chicken is super tender and tasty. To order China Towns at the discounted price of £24 including p&p* (RRP: £30), telephone 01903 828503 or email mailorders@lbsltd.co.uk and quote the offer code APG358. The blackberries have only just flowered here in Scotland, little berries are starting to form but I certainly haven't seen any fully ripened berries in the hedgerow yet. 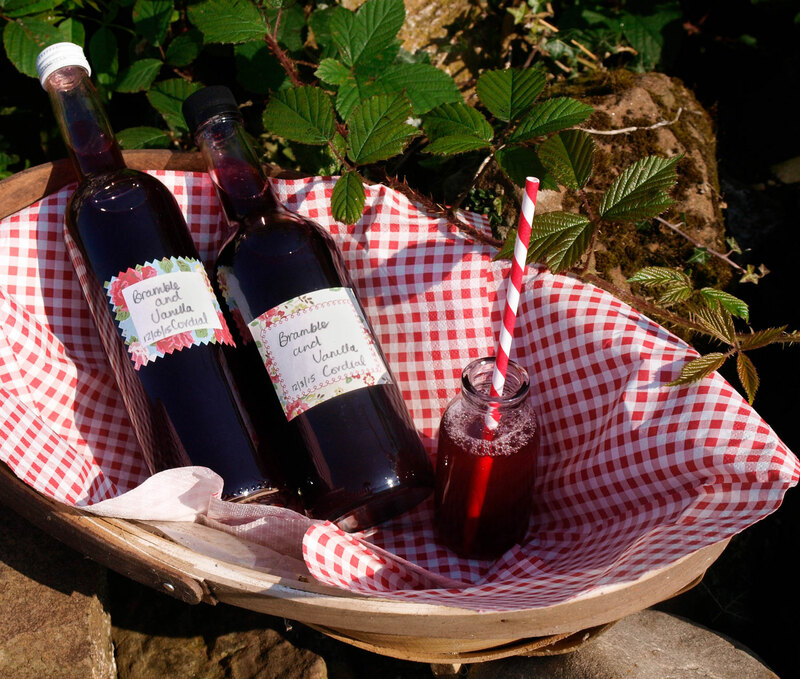 However, I always freeze some berries and my freezer harvest is perfect for making this delicious fruity cordial which is delicious served with water, sparkling water or including in alcoholic cocktails. It's also really easy to make and much less expensive than the high end fruit cordials that I often buy. Rinse the blackberries in a colander, then place in a large pan (I use my pressure cooker, without the lid) with the water. Bring to the boil and boil for 10 minutes. Use a jelly bag, muslin or a clean tea towel and strain the fruit over a clean bowl. Do not squeeze the bag as it will make the cordial cloudy. While the juice is straining, sterilise your bottles. Either rinse thoroughly in cold water then place in a low oven for 30 minutes, or use a proprietary sterilising solution and follow the instructions. Return the juice to the cleaned pan and add the sugar and the vanilla pod, unopened as you don't want the seeds in the cordial, heat gently stirring until the sugar has dissolved, then bring to the boil. Skim off any froth on the top and simmer vigorously for 10 minutes. Remove the vanilla pod, rinse and dry for future use, and pour the cordial into sterilised bottles. 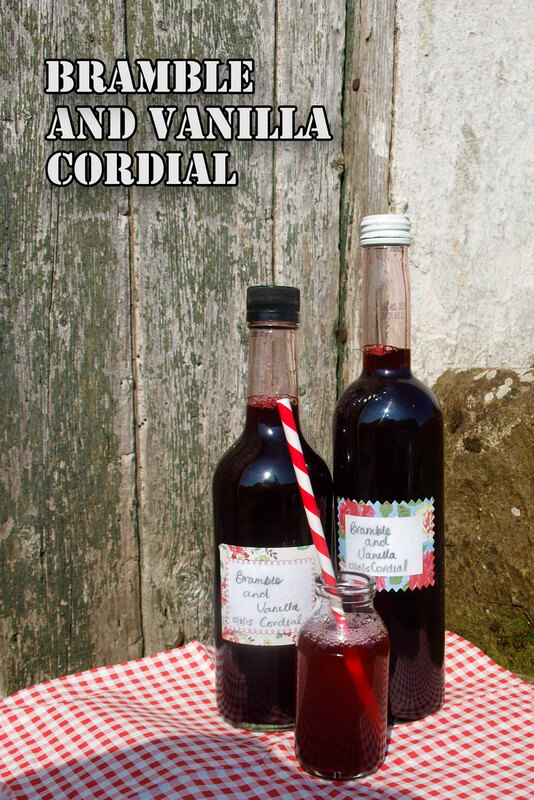 The cordial will keep for up to three months. What I really like about this cordial, is that there is still a little sharpness from the blackberries and the vanilla just tempers it, without the cordial needing to be further sweetened. 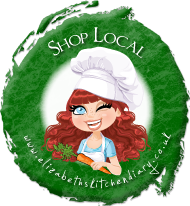 Post your recipe on your blog with a link to Farmersgirl Kitchen and Lavender and Lovage and attach the Great British Blackberry Recipe Round-Up logo as shown above. If you put your post on twitter please mention @FarmersgirlCook @KarenBurnsBooth and #GBBR in your message and we will retweet all those we see. 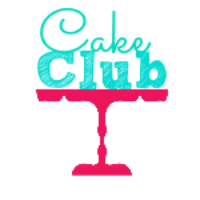 Chocolate cake is the usual request for celebration cakes in our house and I've made quite a few different kinds of chocolate cakes over the years. I'm easily bored, so always like to use or create a new recipe and I found my inspiration at Lavender and Lovage, where my friend, Karen had posted a Salted Caramel and Chocolate Fudge Birthday Cake, many thanks to Karen for allowing me to post her recipe here with my minor variations. Salted Caramel is very on trend and we love it, but as this cake had to be eaten by family with ages ranging from 2 years old to 90+ years old, I needed to keep the flavours a little more traditional, so I took out the salt but kept the caramel. Maltesers make a really effective and simple decoration and they certainly went down well with everyone. Pre-heat the oven to 180C and grease and line two 20cm sandwich cake tins. Put all the cake ingredients into a large mixing bowl and beat well for 3 to 4 minutes with an electric hand whisk, or 5-6 minutes by hand. Spoon the mixture into the prepared tins and level the tops, leaving a slight dip in the middle of the cakes so they rise evenly. Bake for about 25-30 minutes, or until the cakes are well risen and shrinking away from the sides of the cake tins. Remove from the oven and allow to cool in the tins for about 10 minutes, before removing them from the tins and cooling completely on wire racks. First make the basic buttercream, beat the butter with an electric hand whisk until it is well blended. 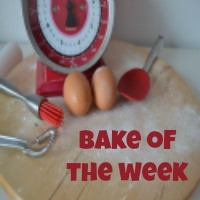 Sift the icing sugar and the vanilla extract into the butter and gently mix together, then using the electric mixer beat until the mixture is fully blended and fluffy. Remove a third of the mixture and place in another bowl, add 3 tbsp of caramel sauce or dulce de leche to the buttercream and mix again. If the mixture seems a little too stiff, then add a little milk. Place the chocolate in a bowl and either melt over a pan of hot water, or melt in the microwave in blasts of 30 seconds to make sure you don't over heat it. Cool the chocolate for about 5 minutes, stirring regularly. Add to the remaining buttercream and beat with the electric whisk. Place one of the cake layers on a serving plate, spread 3 tbsp of caramel sauce over the base (it will sink in). Now spread the caramel buttercream over the base and place the second sponge on top. 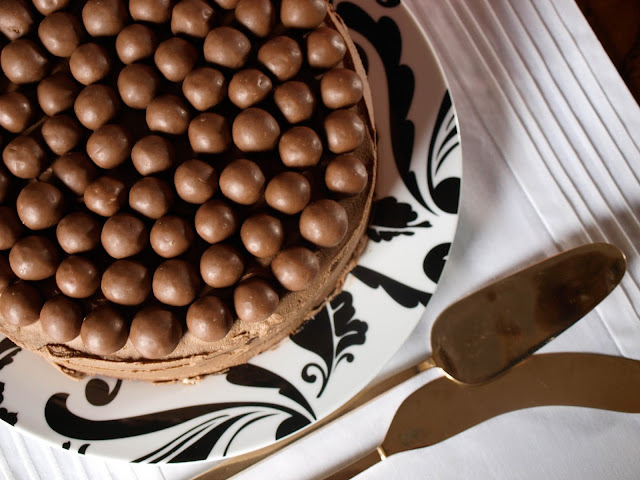 Cover the top and sides of the sandwich cake with the chocolate buttercream and cover the top with Maltesers, starting at the outside and making concentric circles of the chocolates. This is my first entry for Cake Club at Kerry Cooks. 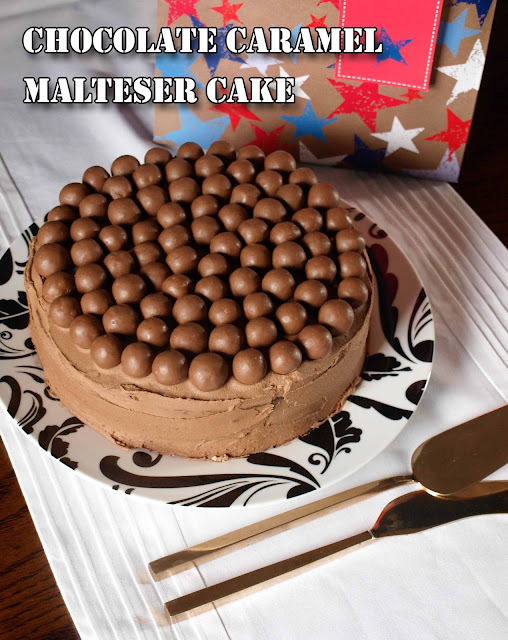 Kerry is also featuring a Chocolate Malteser cake, they are obviously popular! Anything goes at We Should Cocoa this month as long as it contains chocolate which this surely does! 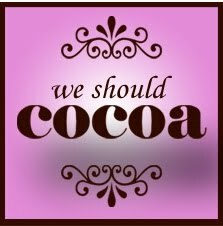 We Should Cocoa is a long standing blog challenge run by Choclette at Tin and Thyme. After the success of the Great British Rhubarb Recipe Round Up in the spring, Karen at Lavender and Lovage and I are launching a new Linky Party to celebrate the blackberry harvest. As Karen is in SW France and I am in SW Scotland, the blackberry season starts and finishes at different times for us, so the Linky will remain open until the 18th of September so everyone has plenty of time to forage in the hedgerows and make delicious recipes with the blackberries you pick. 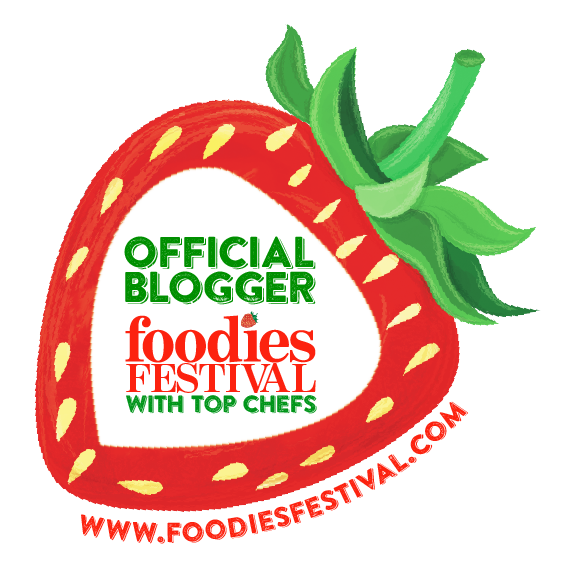 It was a lovely sunny and warm day today in Edinburgh for the 10th Anniversary of the Foodies Festival. Here are a few highlights, the festival continues tomorrow and is well worth a visit. 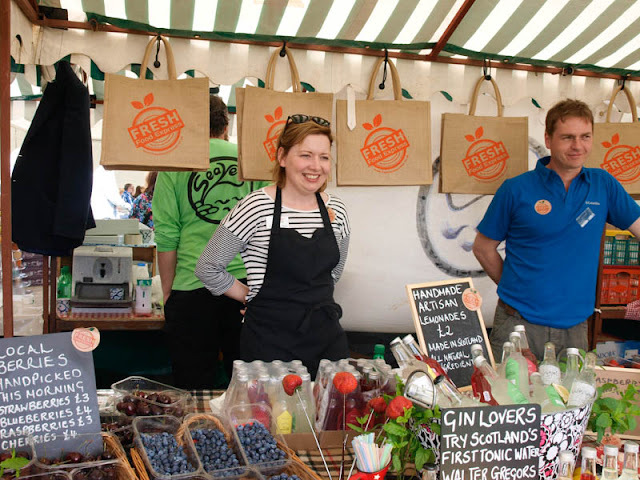 I was delighted to see the lovely Jillian McEwan of Fresh Food Express was attending. Make sure you visit for lovely fresh fruit and Walter Gregory's Tonic Water from Summerhouse Drinks. So now you have your tonic water, you need some Gin to go with it. 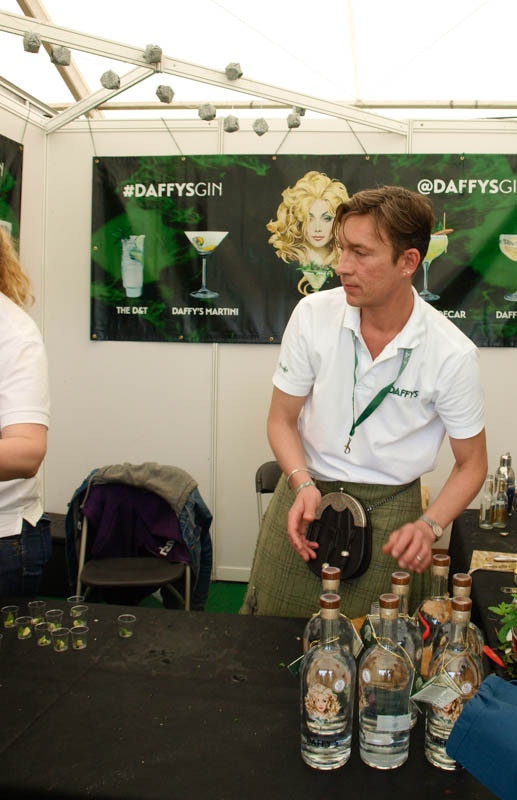 There are a number of purveyors of gin at the festival, but Daffy's Gin was particularly good and the staff were very helpful. Too much booze early in the morning! Time for some lunch, we enjoyed the chicken fajita wraps, substantial and at £5 very good value. 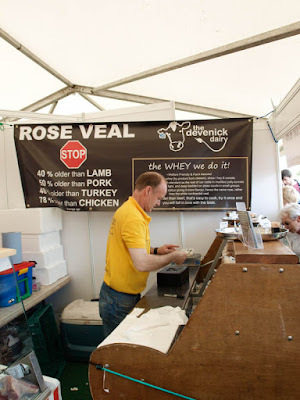 There are lots of different types of foods available at the festival, something for everyone and more vegetarian options than when I was there two years ago, although it is still heavily dominated by burgers and roast meats. 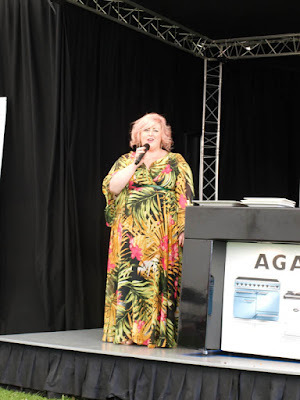 I was really disappointed to see that the Arbroath Smokies stall wasn't there and heard that it had been banned for health and safety reasons, although the BBQ stalls were creating plenty of smoke! We only managed to one of the demos in the Aga Rangemaster Chefs Theatre, Michelle McManus was an able host for the show, asking appropriate questions and keeping the show moving along. The chef here is Marcello Tully from Kinloch Lodge in Skye. The food he made was excellent although he is obviously not used to demonstrating and was also handicapped by domestic equipment rather than a chef standard food processor. 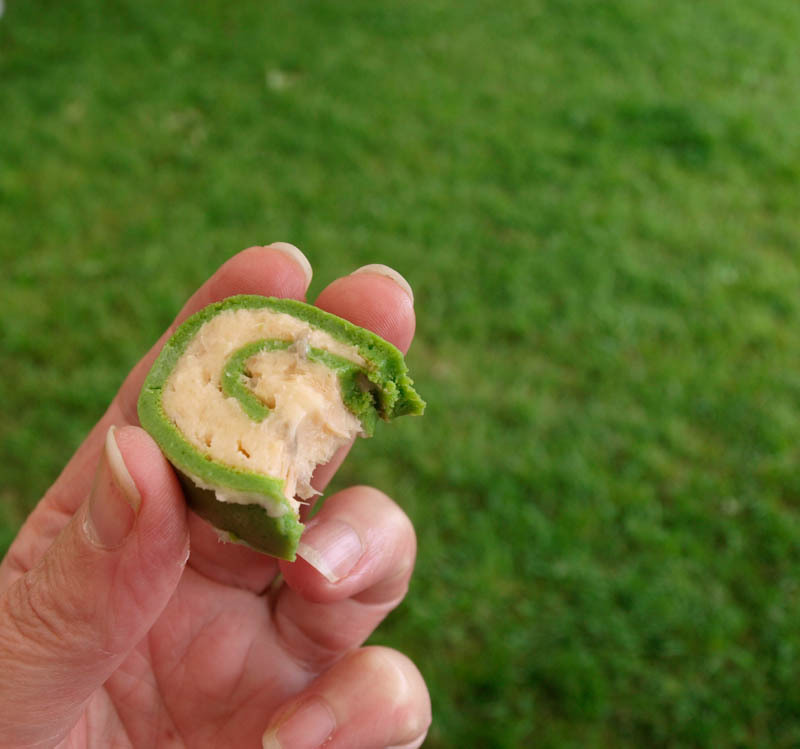 However, he created a fabulous salmon mousse which he served in different ways including made into a roulade in a spinach pancake (see below). He also made a clever strawberry dessert which I think I may try to recreate. Back to the producers stalls and we were very impressed by the cheeses at The Devenick Dairy from Banchory, Aberdeenshire. An excellent deal of £10 for three pieces of cheese and a pack of oatcakes, how could I resist! 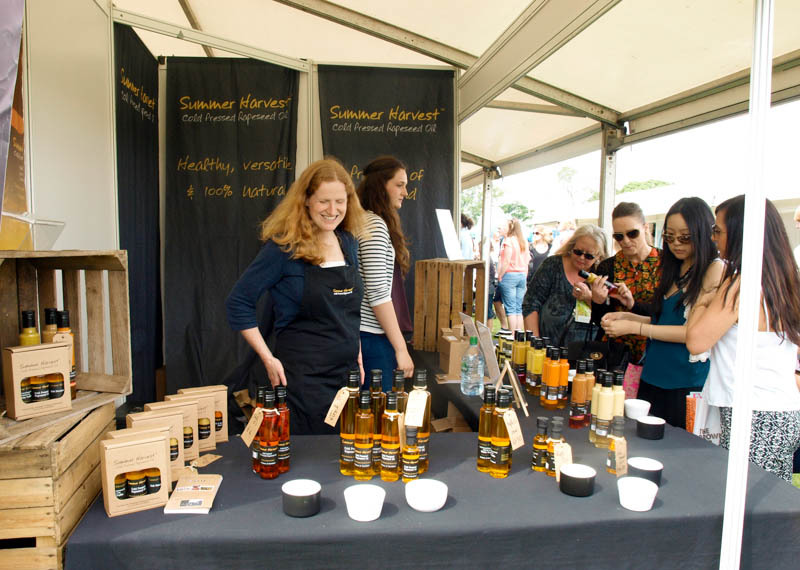 Be sure to visit Summer Harvest to try their delicious Scottish cold-pressed rapeseed oils, salad dressings and vinegars. The staff are helpful and knowledgeable, and once you taste the products you will want to have them in your kitchen. 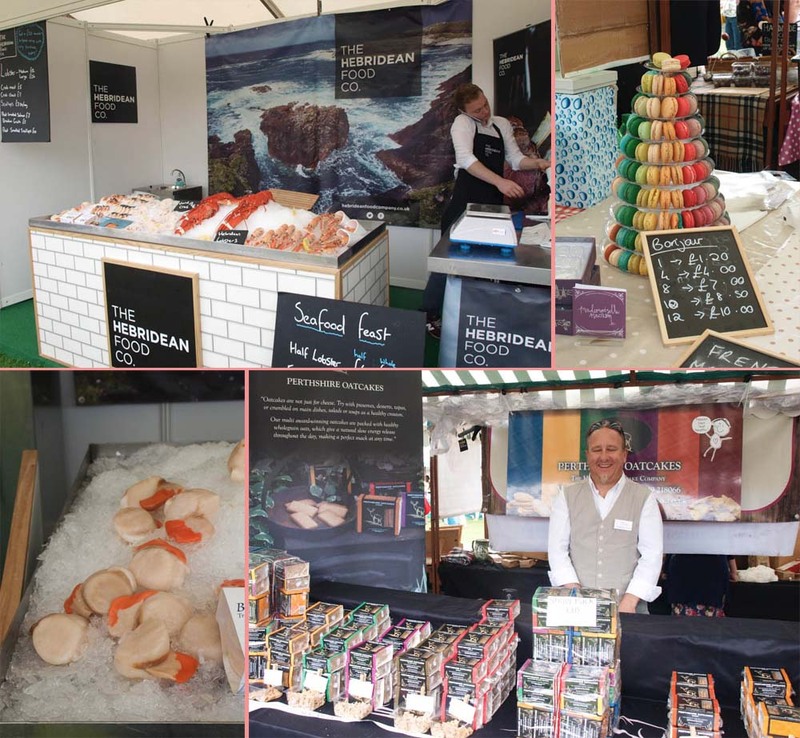 We were impressed by the scallops at The Hebridean Food Co, not impressed by the price of the macarons! Nice to say hello to Chris at Perthshire Oatcakes. 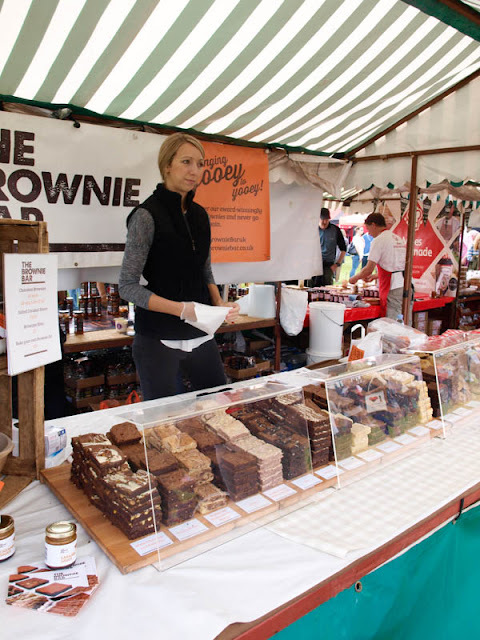 Last but by no means least, do not miss a visit to The Brownie Bar, these gooey brownies are £2 each but half of one is almost too much they are so rich and delicious, so we felt they were really good value and well made. The good news is, that you can also buy them online. It gets much busier in the afternoon, arrive early. Go to registration as soon as you arrive and register for the theatre sessions. Take a picnic blanket, so you can sit comfortably on the grass. 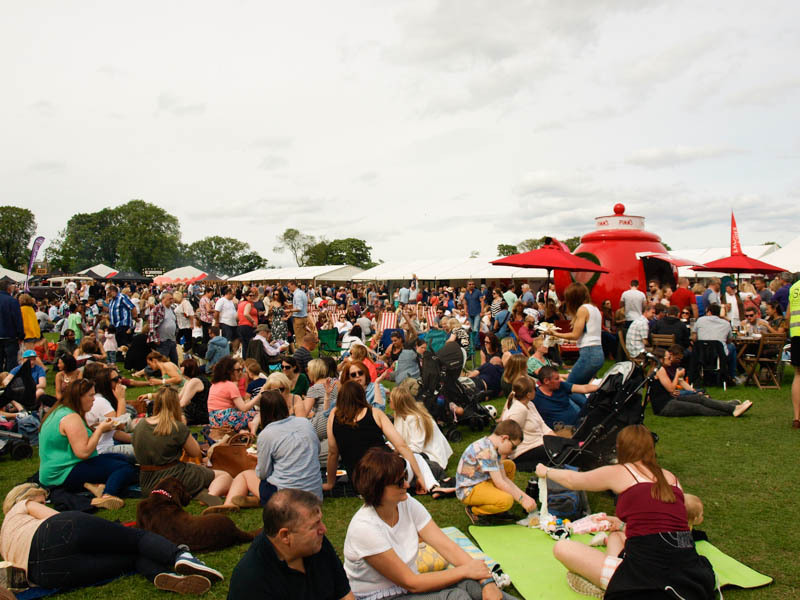 There are long queues at the ladies toilets - use the gents! Take a rucksack, those bottles of gin and oil are heavy to carry. Many thanks to Foodies Festival for inviting me to the festival. 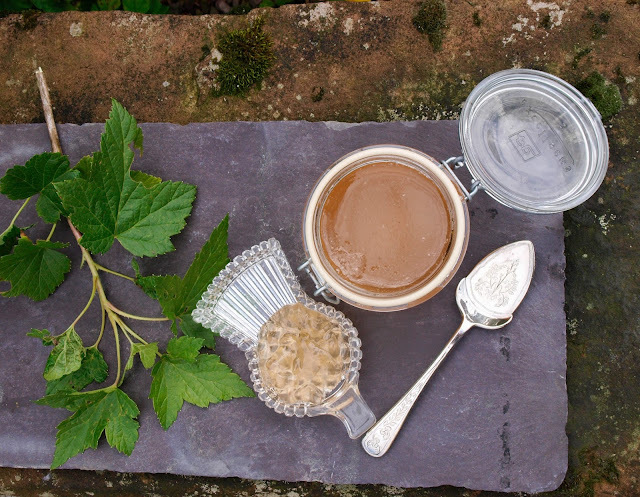 It's a strange one, not quite jam, because you sieve the berries, and not quite jelly as it has a slight thickness from the white currant flesh. 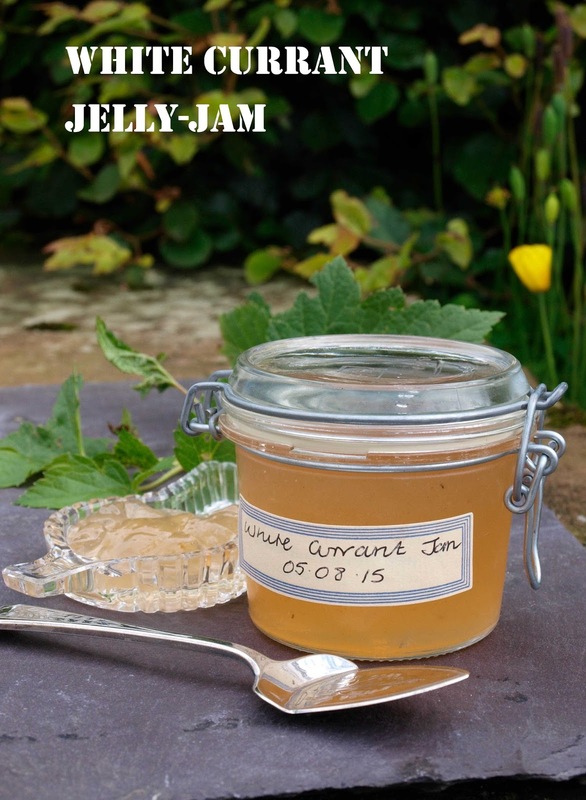 Mine looks more like jelly than the picture on The Well Seasoned Cook, so I decided to call it White Currant Jelly-Jam. It tastes similar to red currant jelly although I think it is a little sweeter, I love the peachy colour which develops as the berries cook and it sets really easily. I spent Sunday afternoon in the kitchen. That's not unusual, but I hadn't been able to use my oven for a couple of weeks due to the installation of a wooden floor. Regular readers will know that I've been having a bit of a time of it over the last 18 months or so, with dry rot treatment and rebuilding half our farm house. We are on the home stretch now and the kitchen floor is the final major disruption. Anyway, back to the baking, I wanted to make something relatively quick and easy but also satisfying, so scones were what came to mind. I'm always looking to fit in my kitchen exploits with one or other of the linky challenges run on other food blogs. I haven't entered We Should Cocoa for far too long and for August, Choclette at Tin and Thyme has given us free rein with an 'Anything Goes' theme, so throw in a bit of chocolate and voila! Rub in the butter and peanut butter until you have fine breadcrumbs. Stir in the chocolate chips. Stir in the eggs and enough milk to make a soft dough, reserving a little milk to glaze. 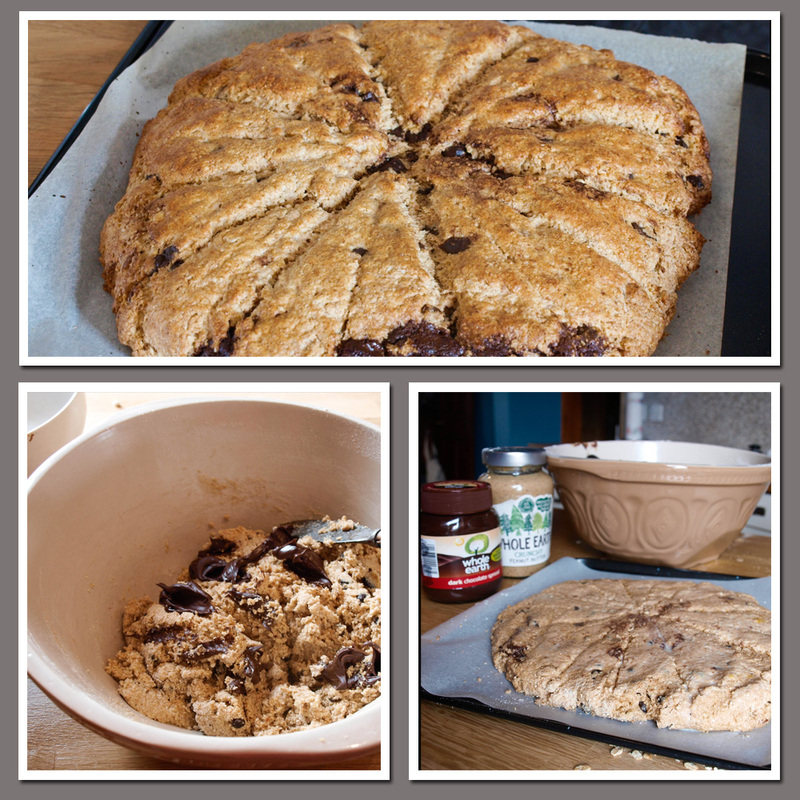 Add the chocolate spread in teaspoonfuls and swirl through the dough with a knife, do not overwork or your scones will be tough. Press the dough onto the tray in a rough circle about 1.25cm thick, mark lightly into wedges with a knife. Brush with milk. Bake for 15-20 minutes until golden brown, leave to cool slightly then slide onto a cooling tray. And the result...a huge success. 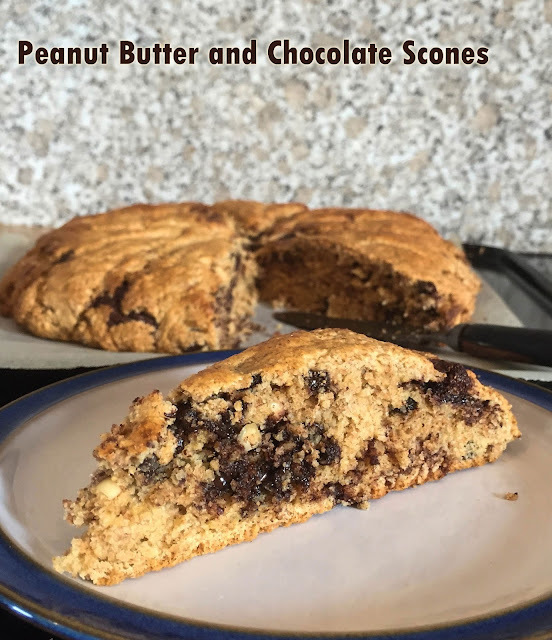 The scones are so full of good things, they are not too sweet with just enough of a crunch of peanuts and swirls of chocolate to make them a great alternative to richer cakes. Why not link up your chocolate recipe to We Should Cocoa? 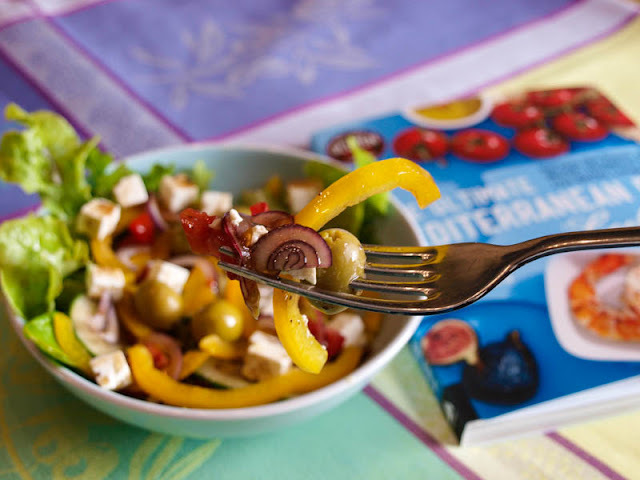 The Ultimate Mediterranean Diet Cookbook by Amy Riolo is not so much a diet cook book as a way of life, unleashing the power of one of the world's healthiest diets. It integrates the latest research and clinical findings with 100 delicious, authentic, easy recipes and Mediterranean lifestyle tips while dispelling any myths and misinformation. Gluten free variations of recipes are also included. As I said this isn't just a recipe book, Amy Riolo gives a comprehensive introduction to the principles of the Mediterranean diet. with the science behind the diet and how the lifestyle is as important as the actual food. 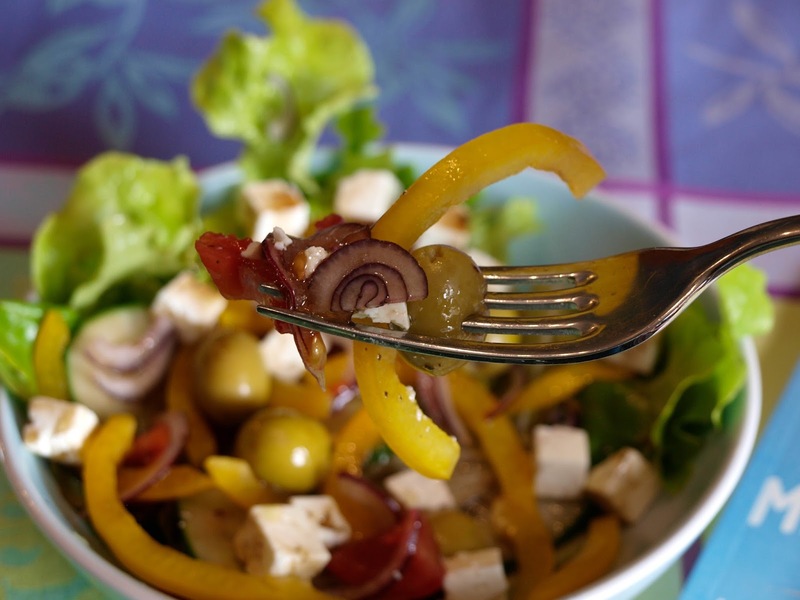 Using the Mediterranean Pyramid as a guide, Amy gets to the core of the Mediterranean lifestyle, and explains what is eaten, when to eat it, and why. Each recipe in The Ultimate Mediterranean Diet Cookbook contains a cultural tip from the Mediterranean region. Fun historical facts, legend, and lore, as well as nutritional information accompany each recipe. Wholegrains: Gooey Mediterranean-Style Cornbread which contains sundried tomatoes and mozzarella; North African Spice-Dusted Sweet Potatoes; Libyan Lamb Couscous and Turkish Eggplant and Herbed Rice Pilaf. Fruits: Apricot and Orange Blossom Pudding with Pistachios; Roasted Plums with Basil-Yogurt Cream. Sicilian Swordfish Bundles; Citrus Marinated Salmon with Fennel Cream and Sizzling Rosemary Shrimp over Polenta. Poultry: Chicken Skillet-Style Shwarma with Tahini Sauce; Jerusalem-Style Chicken with Rice, Golden Raisins, and Pine Nuts. Southern Italian Goat and Herb Stew; Herb Roasted Leg of Lamb and Corsican-Style, Almond-Stuffed Figs in Chocolate Sauce, Sweet Carrot and Cardamom Torte. Mediterranean Cooking Basics covers everything you need to know about how to choose and cook the staples of the Mediterranean diet such as beans, polenta and stock. The Mediterranean Pantry is an alphabetical list of ingredients used in the book with information about what it is, where it comes from and how it is used in cooking. Who is it for? This is an ideal book for anyone who wants to eat a healthy diet and is looking for information and recipes to help them achieve and sustain a healthful way of life. It's also for anyone who loves good food, never mind whether it's healthy, as there are lots of really mouthwatering recipes. Lots of good healthy recipes, plenty for vegetarians and vegans too. I loved the comprehensive introductory chapter information and the Mediterranean Traditions with each recipe. The only thing I would say is that the book doesn't stay open very well, so you need a book stand or have to bend back the spine, which would break it (I simply can't bear to do that!). This would be a useful book to have in your collection if you would like to understand more about eating well. The recipes are easily achievable, although I have to say that they are more attractive to eat in the summer when we have a chance of at least some more Mediterranean weather, than in the cold days of winter when comfort food is more attractive. Place the lettuce in a large salad bowl. add the tomatoes and cucumber, and toss to combine. Scatter the feta, olives, onion and pepper over the top in an attractive pattern. Pour wine vinegar or lemon juice into a small bowl. Add a pinch of salt and pepper, and slowly pour in the olive oil while whisking vigorously. Once the dressing is emulsified, pour it over the salad and serve immediately.